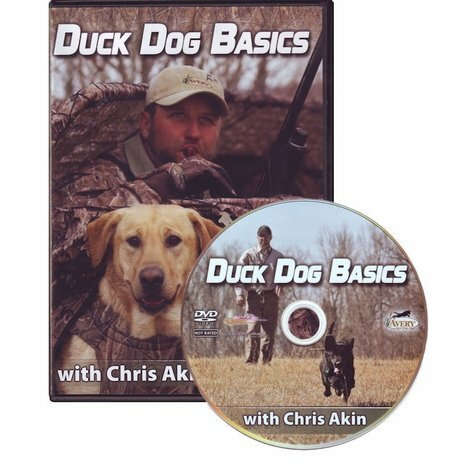 Duck Dog Basics DVD with Chris Akin. $19.99. Today we're looking at "Duck Dog Basics" by Chris Akin. "Duck Dog Basics" is a basic training DVD. It's going to cover everything from starting your puppy and how to pick him out, doing all your basic puppy work, up to your single retrieves and your double retrieves. It is a complete training video for the majority of the duck dogs out there. After you get through with "Duck Dog Basics" and you are ready to take your dog to the next level, then "Duck Dog Basics 2" covers your handling. It's mainly your T Drills and how to get your dog comfortable with hand signals and how to have more control with him over in the field. Akin is a big-time hunter and does wonderful work with dogs. It's just a great set of DVDs. If you are looking for a way to train your duck dog this is a great way to go. "His methods are proven by the sheer number of champions he has put out." A great DVD for the new owner or experienced one. You can tell that Chris has a great passion for his work and a love for the dogs. His methods are proven by the sheer number of champions he has put out. Thanks for sharing your talents Chris! "He keeps it simple and allows anyone to understand the thought process behind training a duck dog." I think chris did a great job with this dvd! He keeps it simple and allows anyone to understand the thought process behind training a duck dog. His ideas and tactics work great for everyone. Keep it simple and sucess will follow. "Well put together, easy to understand and follow"
This program is well put together, easy to understand and follow. Will write another review when my Dog has completed the entire program. Great Video! Fast Shipping! Thanks!!! "This dvd explained everything clearly." I am new at dog training, and this dvd explained everything clearly. "A great training tool for her." I purchased this for my 15 year old daughter to help train our pup, and she understands it perfectly. A great training tool for her. 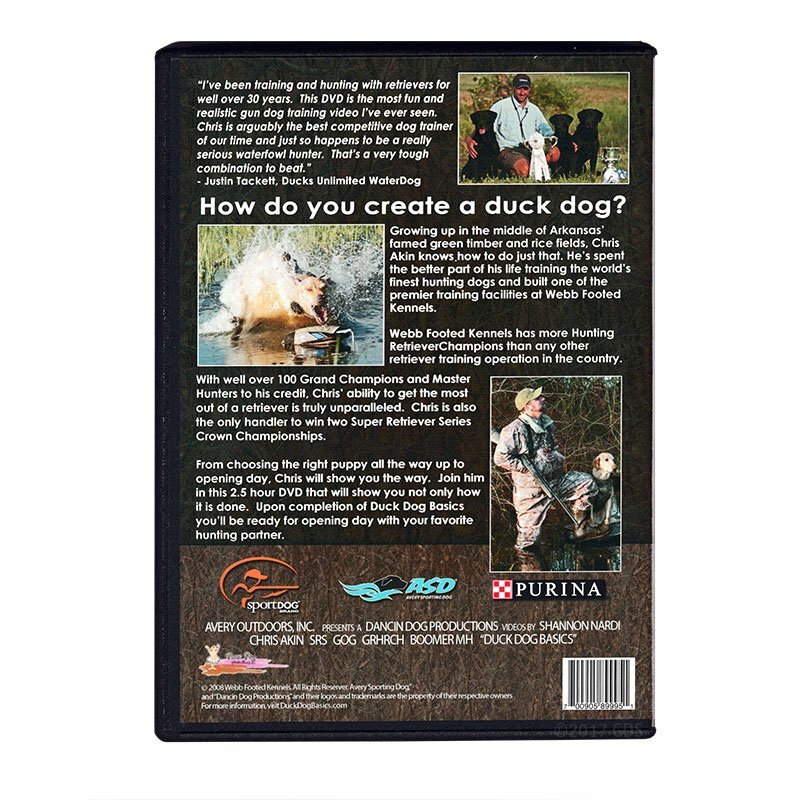 "Great DVD for the amateur trainer"
Great DVD for the amateur trainer and/or the guy who is training his first duck dog. "Great products, and fast shipping." Great products, and fast shipping. Just wish they would give me more orange bumpers for free. "I would highly recommend this to first time lab owners like us." We have been using the techniques taught in this video for 2 weeks now. We are seeing great results with our black lab, Lexi. I would highly recommend this to first time lab owners like us. This movie is awesome. This is my first time training a waterfowl dog, and I was lost at where to start or timing on levels of training. But this movie helped a bunch soon impressed play. It won't take no time to catch on and feel better at yourself with your training skills. "This is a very good DVD.. Different training methods than I have seen before, but effective." This is a very good DVD.. Different training methods than I have seen before, but effective. Really like the way he treats the dogs in the training. Great video. Highly recommend if you plan on training your dog. Just bought this for the basic obedience, I had this previously for my chocolate lab. Great video. There is a ton of info in this dvd. Chris Akin makes training these dogs look easy. He covers just about everything in this dvd. "Informative and easy to follow." Informative and easy to follow. Wish he spent more time on force fetch, but otherwise a very good training video. Take the first step in training your dog to be a duck dog. How do you create a duck dog? Growing up in the middle of Arkansas' famed green timber and rice fields, Chris Akin knows how to do just that. He's spent the better part of his life training some of the world's finest hunting dogs and establishing his premier training facilities at Webb Footed Kennels. With well over 100 Grand Champions and Master Hunters to his credit, Akins' ability to get the most out of a retriever has been proven repeatedly. He is also the only handler to win the Super Retriever Series Crown Championship twice. From choosing the right puppy all the way up to opening day, Akins will show you in this DVD how it's done. Upon completion of Duck Dog Basics, you'll be ready for opening day with your favorite hunting partner. "I've been training and hunting with retrievers for well over 30 years. This DVD is the most fun and realistic gun dog training video I've ever seen. Chris is arguably the best competitive dog trainer of our time and just so happens to be a really serious waterfowl hunter. That's a very tough combination to beat." Akin's Answers - What to do with my puppy? Akin's Answers - What do I do with my puppy when I come home? Akin's Answers - Puppy Teeth? Akin's Answers - When should formal training begin? Akin's Answers - Can I continue to throw retrieves during Force Fetch? Chris Akin is a duck hunter. His entire career has been built on a love for duck hunting. It wasn't long after high school that Chris figured a way to make a living as close to duck hunting as possible. It was dogs. He began to understand that he had a natural talent to train retrievers, and with time, he developed into one of the very best of our time. Chris' training style is what many might call unconventional. Unlike just about every other great, Chris' training doesn't fall into a "Rex Carr or Farmer/Aycock" theory. It's all based on a huge number of retrievers trained. It's a safe argument to say that at 41 years old, Chris may have trained more retrievers than anyone in history. With right under 4,000 retrievers going through Webb Footed Kennels over the past 20-plus years, there are very few that can claim to see and actually handle anywhere close to as many retrievers as Chris has. Chris' style is based on a retriever's strengths as his style uses a less-pressure approach. You'll find that Chris uses more "attaboys" and "attagirls" than almost any trainer in the business. Chris, his wife Janet and children Kristen and Clay live about 100 yards west of Webb Footed Kennels in the northeastern tip of Arkansas in Bono. He's well known for training all seven days of every week, so don't be afraid to stop by and ask questions anytime.